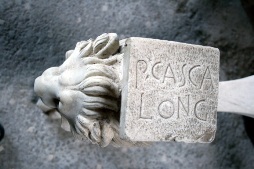 Base of marble table with the inscription "P. Casca Long (us)"
The house owes its name to the inscription borne by the trapezophori, that is the statues which support the table, and probably belonged to that Casca Longus who was one of the protagonists in the conspiracy which led to the assassination of Caesar. On the walls of the atrium a delightful decoration showing scenes related to the theatre can be admired, and in one of the rooms, another one with floral motifs. Later he became tribune of the people and, in exile, he went to the East, where he died in 42 BC together with Brutus after the battle of Philippi in Macedonia. His goods were confiscated and, through public sales, the table was obviously purchased by the wealthy owner of this domus.